AdvExt Gracia Epilogue is a fully functioning Gracia Epilogue server based on the original PTS server core along with a number of improvements, functionality extends and mechanics settings and configurations that allow the server owner to tune the game more flexible for any practical task. In AdvExt Gracia Epilogue we recreated all original functionality of the current chronicles version. The server functionality and game mechanics are neither replics nor a copy, but an original product. Everything works the way it should work on official servers: all weapons and armors types, quests, skills, transformations, elemental attributes, monsters and bosses etc. 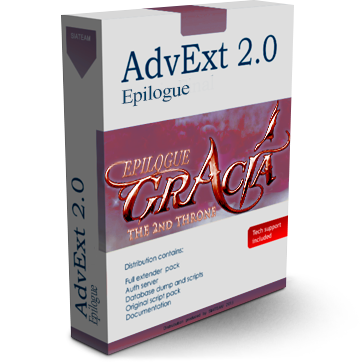 By purchasing AdvExt Gracia Epilogue you are acquiring a set of components.